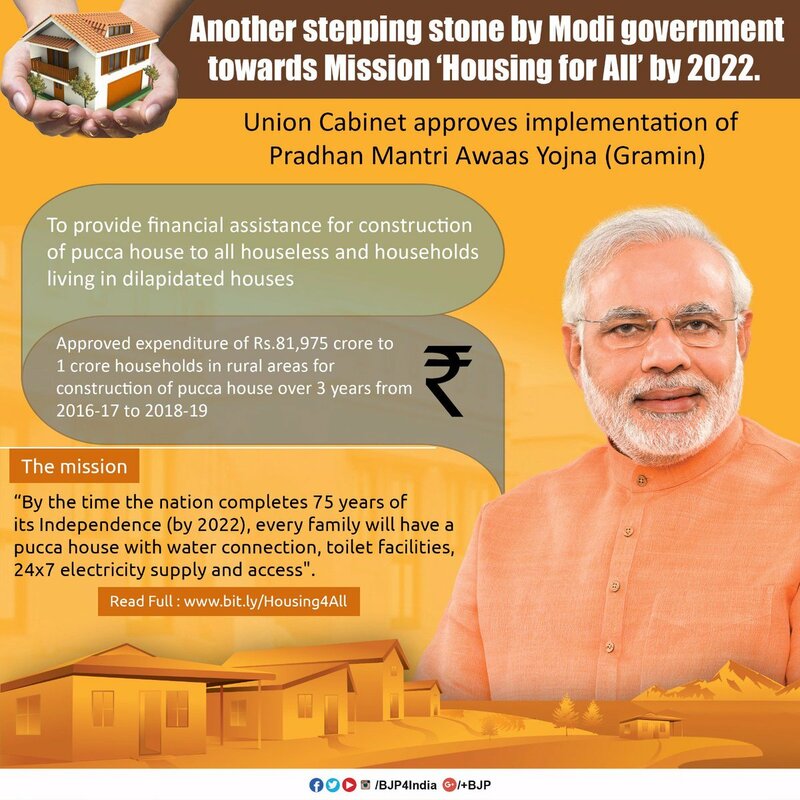 The Union Cabinet, chaired by the Prime Minister Shri Narendra Modi has given its approval for the implementation of the rural housing scheme of Pradhan Mantri Awaas Yojana – Gramin. Under the scheme, financial assistance is provided for construction of pucca house to all houseless and households living in dilapidated houses. The expenditure involved in implementing the project in a span of 3 years from 2016-17 to 2018-19 is Rs.81975 crore. It is proposed that one crore households would be provided assistance for construction of pucca house under the project during the period from 2016-17 to 2018-19. The scheme would be implemented in rural areas throughout India except Delhi and Chandigarh. The cost of houses would be shared between Centre and States. a) Implementing the rural housing scheme of Pradhan Mantri Awaas Yojana -Gramin. b) Providing assistance for construction of 1.00 crore houses in rural areas over the period of 3 years from 2016-17 to 2018-19.
c) Enhancing the unit assistance to Rs. 1,20,000 in plain areas and to Rs. 1,30,000 in hilly states/difficult areas /IAP districts. d) Meeting the additional financial requirement of Rs 21,975 crore by borrowing through National Bank for Agriculture and Rural Development (NABARD) to be amortised through budgetary allocations after 2022.
e) Using SECC-2011 data for identification of beneficiaries. f) Setting up of National Technical Support Agency at national level to provide technical support in achieving the target set under the project. i. Identification of beneficiaries eligible for assistance and their prioritisation to be done using information from Socio Economic and Caste Census (SECC) ensuring total transparency and objectivity. ii. The list will be presented to Gram Sabha to identify beneficiaries who have been assisted before or who have become ineligible due to other reasons. The finalised list will be published. iii. The cost of unit assistance to be shared between Central and State Governments in the ratio 60:40 in plain areas and 90:10 for North Eastern and hilly states. iv. Annual list of beneficiaries will be identified from the total list through participatory process by the Gram Sabha. Gram Sabha will need to justify in writing with reasons for any alteration of priority in the original list. v. Funds will be transferred electronically directly to the account of the beneficiary. vi. Inspection and uploading of geo referenced photographs will be done though a mobile app. Beneficiary will also be able to track the progress of his payments through the app. vii. The beneficiary is entitled to 90 days of unskilled labour from MGNREGA. This will be ensured through a server linkage between PMAY and MGNREGA. viii. Locally appropriate house designs, incorporating features to address the natural calamities common to the region will be made available to beneficiaries. ix. To address the potential shortage of masons training for masons will be undertaken as an ongoing process. x. To meet the additional requirement of building materials, manufacture of bricks using cement stabilised earth or fly ash will be taken up under MGNREGA. xi. The beneficiary would be facilitated to avail loan of up to Rs.70,000/- for construction of the house which is optional. xii. The unit size is to be enhanced from the existing 20 sq.m to up to 25 sq.m including a dedicated area for hygienic cooking. xiii. Intensive capacity building exercise for all the stake holders. xiv. Support will be provided at district and block levels for technical facilitation and addressing quality issues in house construction. xv. A National Technical Support Agency will be set up to provide technical support to the Centre and States to facilitate construction of the houses targeted and to ensure their quality.